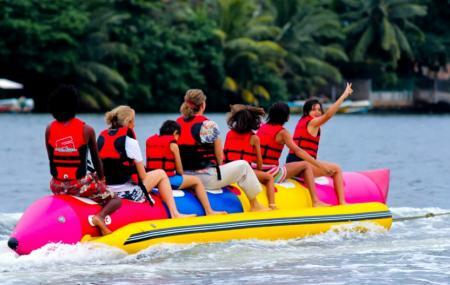 The Sri Lanka Watersports (Sunshine) centre lies directly on the Bentota River, in Aluthgama. They organize activities like Surfing, windsurfing, waterskiing, body boarding, banana ride, tube ride, jet-ski, River Fishing, Snorkelling, diving and river cruises. Go ahead, YOLO! How popular is Sunshine Centre? People normally club together La Luna Water Sports Centre and Bentota Beach while planning their visit to Sunshine Centre. About 5,000 rupees were stolen from me. I do not recommend. Very Best & Well knowing Safety Place for Water Sports with well Trained & Well experience Water Sports Instructors & also Liability Insurance Covered up to 10 Million for each & ever Accident ...! Recommend Place for Safety Water Sports in Srilanka ...!!! Great place and good staff. Kids have heaps of things to do in terms of water sports.